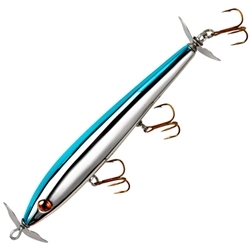 The Cotton Cordell Boy Howdy topwater lure features props on both ends of the bait that spit and gurgle to mimic a wounded baitfish struggling for its life. It's one of the best topwaters you can throw to schooling bass or stripers because it can be fished aggressively to catch them while they're smashing the top, or more subtly to draw them back up during a pause in the frenzy. It's also a great topwater lure when you need to slow down and thoroughly work a spot. The props can be bent forward for a slower retrieve with more surface disturbance, or bent back for a quicker, quieter retrieve.